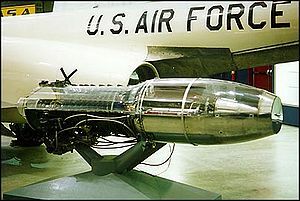 The Westinghouse J34 was a turbojet engine developed by Westinghouse Electric Corporation's Aviation Gas Turbine Division in the late 1940s. 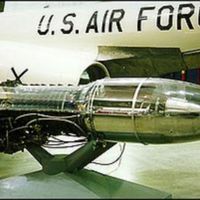 Essentially an enlarged version of the earlier Westinghouse J30, the J34 produced 3,000 pounds of thrust, twice as much as the J30. Later models produced as much as 4,900 pounds with the addition of an afterburner. The engine was first used for flight in 1947. This photograph was likely taken at the National Museum of the U.S. Air Force in the early 2000s. Original color photograph: Wright-Patterson Air Force Base, Ohio. “Westinghouse J34 Engine.” RICHES of Central Florida accessed April 26, 2019, https://richesmi.cah.ucf.edu/omeka/items/show/7710.